For a single quantile, two plots are particularly useful in revealing outliers and leverage points: a scatter plot of the standardized residuals for the specified quantile against the robust distances and a scatter plot of the robust distances against the classical Mahalanobis distances. You can request these two plots by using the PLOT=RDPLOT and PLOT=DDPLOT options, respectively. You can also request a normal quantile-quantile plot and a histogram of the standardized residuals for the specified quantile by using the PLOT=QQPLOT and PLOT=HISTOGRAM options, respectively. You can request a plot of fitted conditional quantiles by the single continuous variable that is specified in the model by using the PLOT=FITPLOT option. All these plots can be requested by specifying corresponding plot options in either the PROC QUANTREG statement or the MODEL statement. If you specify same plot options in both statements, options in the PROC QUANTREG statement override options in the MODEL statement. You can specify the PLOT=QUANTPLOT option only in the MODEL statement to request a quantile process plot with confidence bands. The plot options in the PROC QUANTREG statement and the MODEL statement are summarized in Table 83.10. See the PLOT= option in the PROC QUANTREG statement and the PLOT= option in the MODEL statement for details. The following subsections provide information about these graphs. The QUANTREG procedure assigns a name to each graph it creates. You can use these names to refer to the graphs when you use ODS. The names along with the required statements and options are listed in Table 83.11. When the model has a single independent continuous variable (with or without the intercept), the QUANTREG procedure automatically creates a plot of fitted conditional quantiles against this independent variable for one or more quantiles that are specified in the MODEL statement. For a single quantile, the confidence limits for the fitted conditional quantiles are also plotted if you specify the CI=RESAMPLING or CI=SPARSITY option. (See Figure 83.14.) 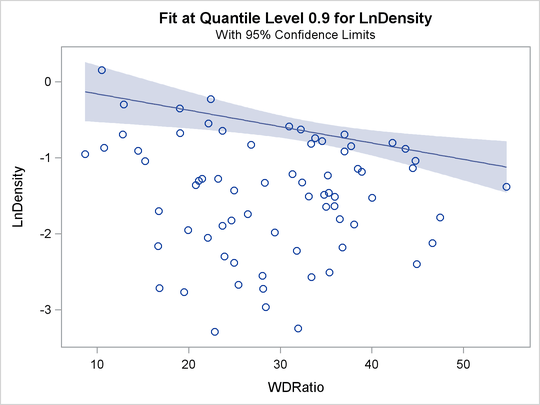 For multiple quantiles, confidence limits are not plotted by default. (See Figure 83.15.) You can add the confidence limits on the plot by specifying the option PLOT=FITPLOT(SHOWLIMITS). A quantile process plot is a scatter plot of an estimated regression parameter against a quantile. You can request this plot by specifying the PLOT=QUANTPLOT option in the MODEL statement when multiple regression quantiles are computed or when the entire quantile process is computed. Quantile process plots are often used to check model variations at different quantiles, which is usually called model heterogeneity. By default, panels are used to hold multiple process plots (up to four in each panel). You can use the UNPACK option to request individual process plots. Figure 83.10 in the section Analysis of Fish-Habitat Relationships shows a panel that includes two quantile process plots. Output 83.2.9 in Example 83.2 shows a single quantile process plot. Example 83.3 demonstrates more quantile process plots and their usage. The distance-distance plot (DDPLOT) is mainly used for leverage-point diagnostics. It is a scatter plot of the robust distances against the classical Mahalanobis distances for the continuous independent variables. For more information about the robust distance, see the section Leverage Point and Outlier Detection. If is a classification variable is specified in the model, this plot is not created. The reference lines represent the cutoff values. The diagonal line is also drawn to show the distribution of the distances. By default, all outliers and leverage points are labeled with observation numbers. To change the default, you can use the LABEL= option as described in Table 83.5. 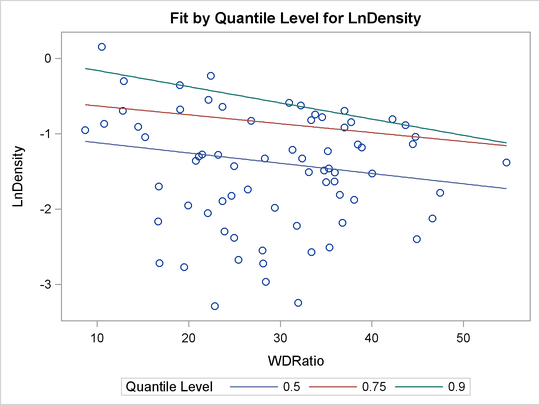 The residual-distance plot (RDPLOT) is used for both outlier and leverage-point diagnostics. It is a scatter plot of the standardized residuals against the robust distances. For more information about the robust distance, see the section Leverage Point and Outlier Detection. If a classification variable is specified in the model, this plot is not created. The reference lines represent the cutoff values. By default, all outliers and leverage points are labeled with observation numbers. To change the default, you can use the LABEL= option as described in Table 83.5. If you specify ID variables instead of observation numbers in the ID statement, the values of the first ID variable are used as labels.